Prince Poniatowski, nephew of the king de Pologne Stanislas-Auguste, is a colonel of dragons in the Austrian army. In 1789, it enrôle in the capacity as general major in the Army of reorganized Poland. Demolishes by the Russians (1792), it must exile itself. After the victory of Napoleon with Iéna and Auerstadt (October 14, 1806), prince Poniatowski receives the command of a division. He is distinguished in particular in Dantzig and Friedland, which is worth to him to be named Minister for the War of the provisional government, then, in 1808, généralissime of the Grand-Duchy of Warsaw (created on July 22, 1807). Prince Poniatowski gives on foot the Polish army, which worries Austria and Prussia. On command of the Emperor, who takes in the passing his prestigious elements to form the regiment of light horsemen of his imperial guard, part of the Polish army leaves to fight in Galicie. Poniatowski resists ataque Austrian against Warsaw (April 1809) and reconquers parts of old Poland by beating the Austrians with Gora and Grochow. By way of reward, Napoleon grants to him the large-eagle of the Legion of Honor, a sabre of honor and a shako of lancer. For as much, Poland is far from being reconstituted. 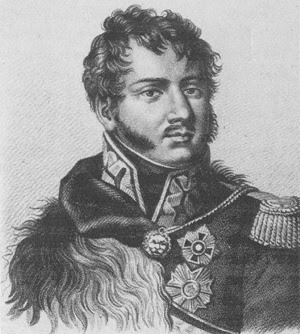 Poniatowski, remained faithful to Napoleon, continues his activity of Minister for the War. It creates schools of engineering and artillery and organizes the fortification of many fortified towns. In April 1810, it is in Paris for the marriage of Napoleon with Marie-Louise. In 1812, to the head of the 5th body at the time of the campaign of Russia, it gives all its measurement to the battle of Moskowa. Poniatowski is the only foreigner to receive the stick of marshal of the hands of Napoleon (October 16, 1813). But, a few days later, by covering the retirement of Leipzig, it is embedded in Elster. Joseph Poniatowski, the Prince of Poland, faithful allied of France. He joined Napoleon hoping to free Poland from Prussia and Russia, but in the facts his Fatherland passed under the French control. He died on 1813, during the Leipzig battle, three days after receiving the Marshall stick. 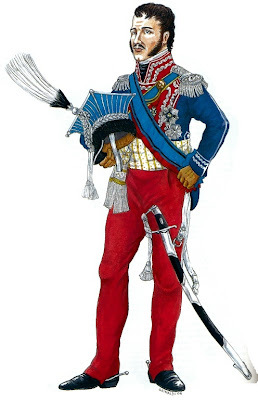 Classic uniform of Polish lancers, with the blue sash of the Polish Order "Virtuti Militari".